CONFESSIONS Saturday 5.30-5.50pm; Sunday 9.30-9.50am; or on request before or after any Mass..
Click to download the latest parish bulletin. Up until his arrest, the gospels describe Jesus as active, as doing things, as being in charge, preaching, teaching, performing miracles, consoling people. After his arrest, all the verbs become passive: he is led away, manhandled by the authorities, whipped, helped in carrying his cross, and ultimately nailed to the cross. After his arrest, like a patient in palliative care or hospice, he no longer does anything; rather others do it for him and to him. He is passive, a patient, and in that passivity he gave his death for us. The more something costs us, the greater the demand on our resources and personal commitment. The cost of our salvation was Jesus’ very life; he did not shy away from the demands or cost or personal commitment. And remains even now so committed to us. “Catholicism” – during Lent we will continue watching Bishop Barron’s series, Catholicism, which we started in Advent. Even if you didn’t make it along in Advent you’re still very welcome to join us! The series is at 6pm in the house every Sunday (apart form 31st March) in Lent. 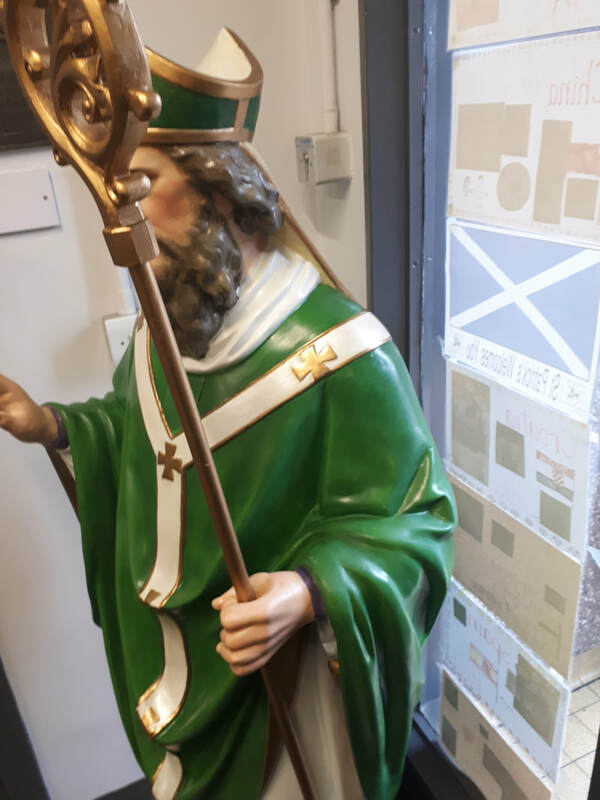 Saint Patrick's Statue – the school’s statue of St Patrick, which we helped repair, has now returned from being renovated and has been formally blessed at a Mass in the school. The statue is looking wonderful: see the parish website or Facebook page.